The operation went well, and Louise soon returned home. She does not recall much, if any, talk about possible complications or symptoms to watch out for. 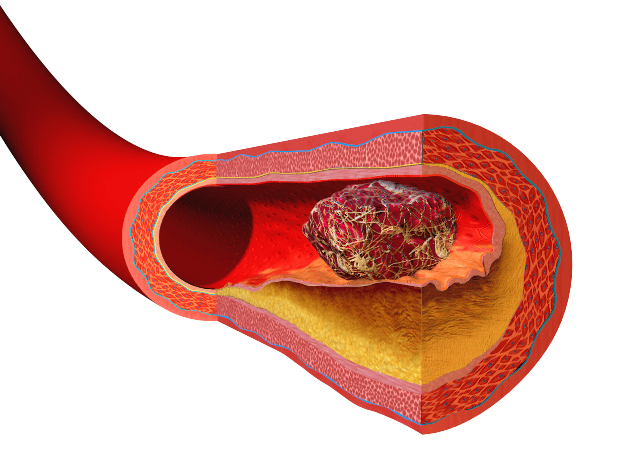 Further, nearly a third of the people who get blood clots die as a result. This situation typically occurs when a blood clot breaks off and travels to the lungs, where it interferes with breathing. As was true in Louise’s case, symptoms may not show up until the patient is home. At that point, people may let down their guard. They may assume that any risk related to being in the hospital went away when they drove out of the hospital parking lot. Dr. Heit reports that blood clots are more common than heart attacks or strokes, and cause more deaths than either of those. He also points out that deaths from blood clots are expected to increase because older people are at greater risk, and the population is aging. Dr. Joseph A. Caprini at Northwestern University has developed a model to gauge a patient’s risk of getting a blood clot. It lists about two dozen risk factors and assigns points to each. Three of the risk factors are being aged 40+, having surgery that lasts 45 minutes or more, and having recently fractured certain bones. As an example, imagine a 55-year-old woman in the hospital after having surgery lasting 60 minutes to treat a broken hip. She would score 1 point for her age, 5 points for her recent broken hip, and 2 points for the 60-minute surgery, for a total of 8 points. Of the people who score 5 or more points, 40-80 percent develop blood clots. Additional examples of risk factors for blood clots among hospital patients are obesity and smoking. In fact, most people who land in the hospital are at risk. This is why it is increasingly common to see risk for deep vein thrombosis be part of the admission screening process. Louise received emergency treatment and recovered from her blood clot. Looking back, she was disturbed that the surgeon assumed right away that her new problem had nothing to do with the operation she’d just had. This dangerous assumption could have killed her. A blood clot in the lung is called a pulmonary embolus. 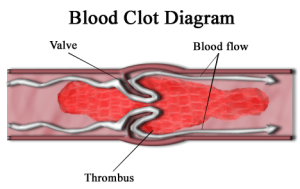 The tissue below the clot dies from lack of blood and oxygen. A large clot blocking a large amount of the lung can be fatal. 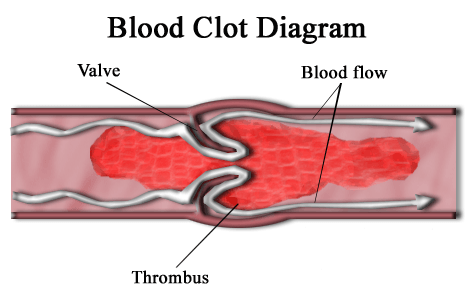 There are common measures used to prevent blood clots in the legs after surgery. The hospital will use sleeves on the patient’s legs that inflate and deflate to stimulate the circulation. They may be used in combination with support stockings (antibembolism stockings to either the knee or mid thigh). Nurses are expected to remove and reapply these three times a day. Lovenox is another common preventive measure. It is typically injected into the abdomen. The nurses should instruct patients to “pump their feet” or move their foot up and down ten times every hour while awake to stimulate their circulation. A surgeon inserts a vena caval filter into high-risk patients to prevent a clot in the leg from traveling to the lungs. The Centers for Medicare and Medicaid Services have identified the development of blood clots in the legs after total hip surgery as a preventable medical error. They have taken a stand that the government should not have to pay for care that results in preventable complications. If Louise was recovering from hip surgery and developed her blood clot in the hospital, and even if it had been diagnosed in time, her hospital would not have received reimbursement for the care needed to treat her blood clot. Had Louise died, her family may have spoken to a plaintiff attorney about whether the delay in diagnosis of her blood clot constituted medical malpractice. Med League provides medical expert witnesses to review the events leading up to cardiac arrests. Contact us for help with your next case.